Definition: The Trend Projection Method is the most classical method of business forecasting, which is concerned with the movement of variables through time. This method requires a long time-series data. The trend projection method is based on the assumption that the factors liable for the past trends in the variables to be projected shall continue to play their role in the future in the same manner and to the same extent as they did in the past while determining the variable’s magnitude and direction. Graphical Method: It is the most simple statistical method in which the annual sales data are plotted on a graph, and a line is drawn through these plotted points. A free hand line is drawn in such a way that the distance between points and the line is the minimum. Under this method, it is assumed that future sales will assume the same trend as followed by the past sales records. Although the graphical method is simple and inexpensive, it is not considered to be reliable. This is because the extension of the trend line may involve subjectivity and personal bias of the researcher. Where S = annual sales; T = time (years); a and b are constants. Exponential Trend: The exponential trend is used when the data reveal that the total sales have increased over the past years either at an increasing rate or at a constant rate per unit time. Box-Jenkins Method: Box-Jenkins method is yet another forecasting method used for short-term predictions and projections. This method is often used with stationary time-series sales data. A stationary time-series data is the one which does not reveal a long term trend. In other words, Box-Jenkins method is used when the time-series data reveal monthly or seasonal variations that reappear with some degree of regularity. 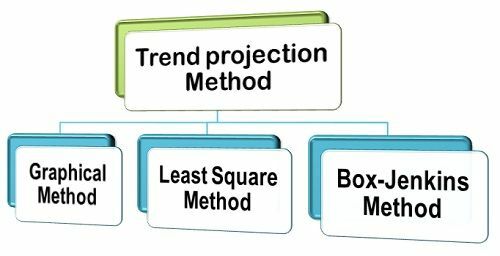 Thus, these are the commonly used trend-projection methods that tell about the trend of demand for a product and are based on a long and reliable time-series data.